Year 12 student, Lucy Crump, was presented with a Scholarship Award of £250 by Head of Sixth Form, Mrs Julie Whitmore, yesterday. 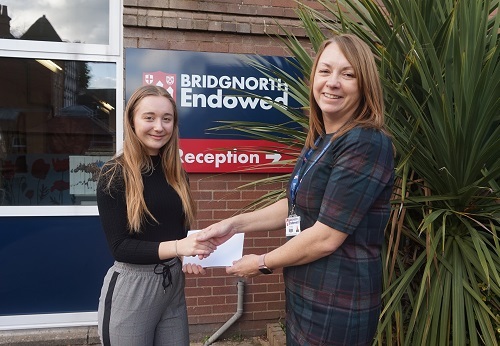 Lucy received the award for achieving an impressive set of GCSE results, including one Grade 9, six Grade 8s and three Grade 7s, and also for choosing to stay on at Bridgnorth Endowed Sixth Form. After her exam success last summer, Lucy is now studying A Levels in geography, maths and business studies, and plans to see how they go before deciding on what to do next. Congratulations to Lucy on her well-deserved award.